Various public responses from different players or reviewers from around the internet. Sources: forums, app store reviews, news posts and reviews – (like Pocket Tactics for example). Title says it all. If you are into turn based strategy this game is a must! I wouldn’t mind more FOW, more Scenarios and not sure about the lack of randomness – beside mortar fire. But show me a better wargame today! Great blend of strategy and playability…an easy to learn, tough to master, game. The pace is great for an iOS game, you play your turn when you’re able, and can have several games going on at once. No two matches are ever the same, which is why multiplayer is so addictive. In fact our whole family is in on it now. Simple rules and mechanics lead to deep strategy and endless possibilities. A very good tactical battle game. Great game.. Without doubt one of the best strategy games made for Ipad! Excellent game! Snow punch really delivers with a turn-based hex and counter wargame. Easily the best wargame of its class on iOS. It has a great balance of units with varied abilities, non-random damage, strong tactical choices, along with a pleasing appearance and sound. This game is wonderful because it is so accessible. The tutorial explains the intricacies without massive text. It’s a quick couple of games to become seriously competitive with everybody online. I could go on and on but don’t waste your time. Buy this game in confidence that you will have fun and that the game has been supported for a long time. If you are into turn based war games then you can’t go far wrong with this. I have purchased and played many turn based games on the App Store and I must say this is one I play constantly. There are never any shortages of online players and the developer is constantly updating the system and listening to feedback. Do yourself a favour and download this. You won’t regret it. A very enjoyable tactical war game, with a great deal of replay value. Fight on a range of maps, fine tune your forces and then apply them to maximise the carnage. This is the first game that have regularly played online matches. While the mechanics are quite simple, you can really get yourself into to some interesting situations, especially when playing the campaign. 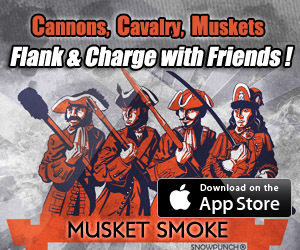 Musket smoke may look a very simple game with regards to its graphics and maps. But do not let this fool you into thinking that this also applies to the gameplay. Minutes to learn but weeks to master the strategy of the game and the tactics that you can leverage are astounding. Charging through smoke unseen by your enemy or flanking an enemy unit and butchering his troops enmass – phenomenally entertaining stuff! I would recommend that beginners try their steel agains the computer first and then move onto the mini matches. Only when you feel confident would I then try the campaign mode. It’s is by far the best feature of the game but it can be a brutal affair! READY MEN! CHARGE!!!!!!!!!! A great simple but deep wargame. Novel campaign structure but with adequate MP options. Great support from developer. Highly recommended. Wargame that simulates battles shift of the Modern Age (pikemen, musketeers …). Very interesting what I’ve seen. Designed for multiplayer via Game Center. One of the best strategy titles available for the iPad. Immense amounts of strategy, replayablity and detail. One of the few must have titles of strategy gamers. Hands down the most fun game I have played on the iPad period. I’m a sucker for historical wargames and musket smoke is one of the best I have played virtual or otherwise. I enjoy it so much, I plan on making some chits and buying a hex board to play it on table top! Recommended game.. Very Nice for strategy game players. A must have! Simple to understand and a great player vs player game. Very balanced with a range of tactics being demanded for a win. One of the best tactical war games currently available for the tablet market. Easy to get into, yet difficult to master. No random results means knowing exactly what damage you will be inflicting and receiving. The latest update includes a cool new mortar unit – use it for behind-the-lines damage or as a primitive smoke screen. I must get back to battle – I am still trying to perfect my tactics! An incredible 17-18 century of battles! If you like tactical wargames you need to purchase this game. You will love it. The current version 1.55 enhances the tactical possibilities of the game immensely. A must for every amateur strategists turn-based with like-minded people online to measure. This is a war game that with a clever economy of mechanisms makes cannons, musketeers, pikemen, and cavalry feel like cannons, musketeers, pikemen and cavalry. I like the non-random determinative damage system, the importance of maneuver, and the variety of the battlefields and tactical challenges. The online matches are tense, full of interesting decisions, and I find myself eagerly awaiting my next turns. As expected the campaign adds units, scenario goals, and additional maps. These increase the tactical depth nicely. What really ratchets up the tension in the campaign is the removal of the ability to undo moves and that line of sight effects enemy unit spotting as well as ranged fire. This adds the possibilities of an ambush, the need to scout, and how to deal with an unexpected enemy encountered during the heat (and smoke) of battle to a game that already had a lot of interesting decisions each turn. ***Disclaimer: I rated version 1.21 four stars and became an unpaid playtester. *** The game is now a five star game for me. All of my minor issues I had have been addressed. The number of improvements goes way beyond what I had hoped for. Things like the rating system, the information bar, the damage preview, the expanded chat window are icing on the cake. This game has become my most played head to head game. If you like round-based strategy games, is a real gem here. Top! “IMO’, it’s serious like a heart attack serious! The tactical options are tremendous! I would quibble with the adjective “abstract” as well but I guess what you mean by that is lack of die rolls right? So a bit more like chess? Personally, I would love this system to support die rolls based on stats but the existing system has so many tactical possibilities already I don’t miss it. The rules are so lovely! Is it based on an existing system? It’s so elegant and well thought out. And the FEEDBACK the game provides with animations ans status texts…. Just BRILLIANT! I would love it if every hex war game took cues from how accessible you’ve made this kind of game. Geez, I wish I could see a warhammer 40k game adapted to this system! I’m not a huge fan of napoleonics and would love to see this system in other settings like pseudo scifi (like 40k) or late medieval with firearms or even ancients. In single player skirmish, you can play against the AI or another human (pass & play), You can select from 8 maps, and three army sizes. This is one of the most elegant turn-based (async if online) strategy games out there. The actual gameplay is simple, but there is no end to the depth. Online multiplayer is seamless. After you get good there is a special online campaign that can be bought that adds more weapons and strategies. this is one of the finest strategy games ever made for any platform. It has a great tutorial, and more info about gamplay, strategies, and units then anyone could ask for. My friend and i are playing online everynight and enjoying it immensely. It seems to be the only game that get him away from XCOM: Enemy Unknown which is also on his iPad. All of that and this game is free! I’ll be sure to buy the 300yen ( about 3 bucks) campaign. This is the game I’ve been looking for for a very long time. Just downloaded and played through some of the tutorial. Lovin’ it! Also saw Keg Bearer (never heard of it till now) under related games and grabbed that too. Mr. Snowpunch, I am a fan! So good, recommend to try. An epic game. Can not put device down while playing it. It’s an absolutely brilliant little wargame. Like, seriously: what an absolutely fantastic system. I’d like to recommend a very enjoyable light Napoleonic title called Musket Smoke. It features turn-based solo and multi-player options. It’s “light” in that you have two generic belligerents and four unit types….pikemen, musket, artillery and cavalry. It’s fun because smoke starts to cloud the field which actually impacts sighting, and bodies appear on the field too. When casualties get high, “gore piles” form which I believe causes a hit to morale. Nifty little game. Musket Smoke is a cool little asynchronous turn based multiplayer wargame. There’s a reasonable AI to practice against, but the meat of the game is against human opponents. The developers have gone out of their way to ensure you’re never too long for a game, and have ensured that there are full replay capabilities so you don’t miss anything. The game itself is deep, yet pretty easy to learn. It is a good introduction to those who are new to the genre, whilst veterans will enjoy the option of playing multiple games at once. There is one IAP in the game, which gives you access to a longer multiplayer campaign, but there are many many hours of enjoyment to be had before you need to go anywhere near this. It’s clearly been a labour of love for the developer. Highly recommended. Best iOS strategy game I’ve found to date Easy to learn, but very deep. Predominately multiplayer, so you’re always pitted against unpredictable human opponents. The graphics are functional, the mechanics very clever, there’s lots of stuff to consider but not many rules to memorise. If you like strategy – get it! What I want from a wargame is a little bit of choice and a fair emulation of the tactics of the period. Musket Smoke delivers. What you want to do is pin the enemy from the front, while sneaking units around his flank and attack him from the rear. Your cannons need to keep good lines of fire, while your cavalry should harass enemy cannons. Somehow Musket Smoke manages to keep it all simple. Perhaps it is the easy interface. Whatever it is, you get to focus on the game and your tactics, while enjoying the feel of the period. The solo game and head to head games will keep you busy for a while, but the real gem is the campaign game. Here you get to fight an extended battle against a human opponent, each taking alternative turns as you fight across different battlefields. *(cut)* You must protect your commander at all times – for if he dies, so does your campaign. It’s a nice touch and well worth the in app purchase. Now what are you waiting for – go download the app! Musket Smoke is more sanguine than your average hex wargame; literally. When a unit is killed in Musket Smoke, it leaves a bloody “gore pile” that affects the morale of nearby units. The game is full of little touches like this: sound effects and animations that make the wargame a less abstract representation of warfare. My favourite bit might be the titular musket smoke that starts to fill the battlefield after your cannons and musketeers have been in action, making it impossible to aim at units beyond the haze. I rather like Woodie Dovich’s lightly Napoleonic-themed game. It’s an abstract strategy game at heart, but it’s got just enough “sim” in it to make it really memorable: the way cannonballs travel in a straight line doing damage to everyone in their path (friend and foe alike), the one-time-only musket volleys that you must carefully consider before deploying. Wargamers should just dive right into this one, and non-wargamers should give it a shot because it’s very accessible and quick to play. It looks like a real wargame … on the iPad … Woot! Interface seems good. Movement is fluid and intuitive. No, certainly no confusing UI! On the contrary. I never looked at any documentation or help and got underway fine. Very intuitive like it is. After a few games, you want to know a bit more about the behaviour of certain units and then start looking in the description of them. Quality turn-based tactics Good stuff! Simple on the surface, but when you add in that smoke blocks line for sight, the charges, the effect of gore… There is a lot to master in this game! Captivating tactical game with broad appeal This is a great game. This is one of those games that when you stop playing, you wonder where the time went. The rules are fairly simple, it is easy to learn, but the tactics and strategy involved on these small maps is satisfyingly rich. It is a bit like a chess game with cannon balls and gore piles. It is also a game that I suspect would have broad appeal–I can see board gamers or general iPad gamers feeling comfortable with the basically straightforward four unit types, and finding themselves very much enjoying an engaging introduction into hex gaming. But I can also see wargamers (who haven’t seen a lot of tactical games to really get excited about on the iPad yet) loving the subtle nuances in the tactics involved with the four units types and the tweaking you can do with your force’s composition. I have played a lot of games on the iPad that have caught my attention for a couple of hours to a couple of days, but this one is different. I can tell that I am going to be happily gore piling folks for some time. Five stars all the way for this gem. Turn-based Strategy Perfection! Even better with the patch! This is without a doubt one of the most fun and most polished, with deep strategy, but easy-to-get-into-gameplay turn-based stragegy games around. And the async multiplayer is seamless. Plays like a dream with no weird online problems like many games have. And an amazing amount of info and tutorials. In-game unit info is also great. Simple yet deep. Great turn-based battle game. Movement via hexes, ranged fire with muskets and cannon, cavalry charges, pike formations, morale, terrain, even “gore piles” — it’s all in here. No dice so luck is minimised; losses are predictable but vary on units’ strength and morale and also depend on which unit attacks and how. Setting up attacks is critical, as is maneuver. Once combat is joined it’s hard to get out so plan well. Works seamlessly via Game Center and no shortage of opponents. Plays quickly too. Highly recommended. All we need now is more scenarios! Great War game In all the new titles this one can get lost but it is a great tactical wargame. One of the the best computerized wargames I have ever played is Musket Smoke by Snow Punch. Set at the dawn of the horse and musket era, this game is as satisfying as any tabletop wargame I have played. Chance has little to do with victory as units do fixed damage. A knowledge of the rules is both instructive and effective. Good gaming produces good results and teaches the principles of this style of warfare. It’s free to play. You can train against the AI and then challenge anybody in the world to mini games. Game turns can be played any time. If your opponent is online games may last half an hour, or you may play when you have a little time here or there and the game may take a couple of days. Note that it is designed specifically for tablets. Snow Punch is hoping that you become obsessive enough to buy the campaign game, and I think that you probably will. Good intro wargame I’m really enjoying playing this with my son. A clear step up over Tank Battles – which is the other wargame we like to play. Great graphic design makes rules and information easy to understand. Five stars! I always appreciate responsive developers Love developers like this who are visible, interact with buyers, and receptive to suggestions. Überraschung des Jahres! Dies ist eines der besten Strategiespiele, die ich in den letzten Jahren gespielt habe.. Ein bisschen Schach, ein bisschen Stratego und doch gleichzeitig ganz neu.. Fantastic! No randomness, a large number of tactical decisions to make and a small number of easily understandable units and options. This is a well put together app with a lot of charm. The developer is very responsive and the app is under active development. I can see myself playing this for a long time to come. Reminiscent of Kriegspiel (not the chess variant). Just grab it! For all those who enjoy tabletop gaming, streamlined and made easier to master in a great game. The turn based system works well in the multiplayer aspect and the game in general, giving time for the player to carefully consider their moves. And allows in multiplayer for battles where people can play when they have the time, then submit their turn to the opponent to be played out later that day or the next. Great payment system, allows players to become familiar with the game, allowing the player to make a more educated decision wether to spend money or not (I know I have). Only real issue with the game is not enough people know about it and are playing it, yet. All the above (that were app store reviews) gave 5 stars: To be fair here, lets also show those not completely satisfied. (4 and 3 stars). (3 stars) Give us an offline campaign This is a fantastic game…when I play single player. The solo matches are the best battle games I have played, but then I spent the $2.99 for the campaign. I don’t get it. The idea and the set-up looks great but the opponent never moves. Why is this not single player where I can play against an AI? If this is made available it would definitely be a 5 star game, but until then I wasted my $3. (4 stars) Awesome Great game. 5 stars if offered off line campaigns. Love the game. Just finished a great Campaign. Well worth the money! Artillery maintain their lethality even as they lose men. Damage from cannon should decrease as the units is depleted, just like musket and melee damage. When a player falls back don’t close the game and move on to the next battle. Let the victor enjoy his win, take a last look at the battlefield and then move on when he is ready. Ending the campaign game. My first campaign finished badly as my opponent had some kind of connection issue and the game ” finished” in the middle of his turn. More information about some of the terrain. Types and their attributes. Eg corn, water, different woods and buildings. Thanks. Love hearing from fans. About artillery damage: Artillery are actually 10 men and a single artillery piece. The 10 men are actually swordsmen and cannoneers combined. Realistically it might take longer to reload if there was only 1 man and would be much slower or impossible to move. But we want to keep the game light and not add any more special exceptions. So if there are only 5 men it’s not going to shoot a smaller cannon ball or use less powder. The cannons actually do damage according to ‘target size’ so if it’s shooting a size 3 target it does 3 damage, and if its shooting a size 1 target it’s doing 1 damage. (Double if targets are locked). Howitzers and mortars however do a flat amount of area damage that is not affected by size. Your next suggestion about lingering after battle is brilliant. I don’t know why I didn’t think of it myself! I will definitely add that one to the future features list. Kind of related to this will be when I add a slider to easily allow you to quickly get to any position in the history of your campaign battles. A new wonderful and properly made manual is in the works. I had to put it on hold as I am starting a new job and learning new tech now, so that is one of the highest priorities for what’s coming next for Musket Smoke. Yes, I am aware of a horrible bug (although it is a bit rare when it happens) that can end a campaign if someone has a connection issue when transitioning from one battle to the other. This has even higher priority than the manual. Eventually I will get back to tweaking the current campaign and also start working on a single player campaign. At the moment I am not sure when I can start on that.. but it will happen eventually. This game is more of personal passion than a business project so good things should keep coming for years. You can help though by sharing news, talking on forums, tweeting, and giving us ratings in the app store and over on ipadboardgames. Written reviews are always deeply appreciated. Just a note here – that Musket Smoke II is currently in development. It will have great online battles ‘of course’ but the core focus is a Single Player Campaign. The campaign will not be just a cheap series of one-off battles. Set in England during the English Civil War and includes resource gathering and a persistent roster between randomly generated battles. I would would go so far as to call it a new type of ‘game’ rather than just a Single Player Musket Smoke Campaign. Your game is great, it’s almost impossible to find a decent wargame about 17th century now. I like how you eliminated random and kept game depth and balance. Thanks GeneralVimes. I had a good time making the game.